Available in multiple sizes to fit little infants, potty training toddlers and big kids with special needs. I researched a lot of options for swim diapers and hated the idea of needing to use a disposable swim diaper in any way. This diaper was perfect for our 9 year old daughter for our beach vacation. The design makes it even look like a bathing suit bottom so I didn’t feel the need to put shorts on overtop! She was so comfortable (from what I could tell). And it worked very well. 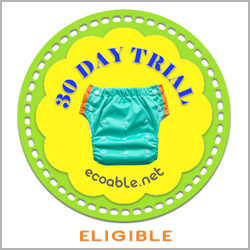 I love that I can also use them as reusable diapers if need be. Love it and will be getting more next year when she most likely needs a bigger size. This is an amazing diaper! I found these while searching for a swim diaper for my 3yr old that is straight out terrified to use the toilet. He is a very BIG 3yr old and I was unable to find any swim diaper that would fit him until I found Ecoable! This particular diaper is awesome and so versatile. I have only used it for swimming so far but I can use it with either my very BIG 3 yr old or my average sized 2 yr old since they are so adjustable which is a huge plus. It will grow with your child and definitely be a great investment!!! Swim diapers are so expensive but I will never buy a pack again :) I also bought the size up youth diaper for my 3yr old since I wasn't sure if it would fit. It works for him but not as great as this style. They definitely hold in the water which can pool while swimming but I think it's really going to come in handy for really giving potty training a go again. 2 big thumbs up for both products and saving money!